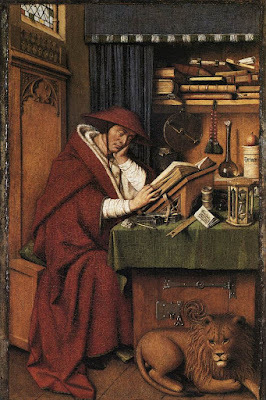 It is to be expected that the Renaissance would greatly admire the figure of St Jerome, second only to St Augustine as the most prolific writer among the Latin Fathers. Augustine himself describes Jerome as “learned in the Greek and Latin tongues, and furthermore in Hebrew,” and says that he had “read all those before him, or nearly all, who had written anything about the Church’s teaching in both parts of the world,” i.e., among the Greek or Latin writers. (Contra Julianum 1, 34) The scholars of the Renaissance prided themselves on their rediscovery of the classical world, and their return to the original sources of Greco-Roman culture. By learning Hebrew and producing a new and better Latin translation of the Bible, that which we now call the Vulgate, St Jerome had done what they themselves were doing, but with the very Word of God itself. In the 15th century, which produced a great many images of St Jerome, he is often shown as a scholar in his study, sitting at a desk and surrounded by books. Since he had revised the Latin version of the Gospels at the behest of Pope St Damasus I, and served for a time as his secretary, he is traditionally depicted as a cardinal, which the contemporary Pope’s secretary would normally be. There are few episodes of what one might describe as a legendary character attached to him, but a famous one is the Christian version of the Androcles and the lion story, that while he was living in his monastery in Bethlehem, he removed a thorn from the paw of a lion, which henceforth became his pet. A lion is therefore usually shown in the study along with the Saint. 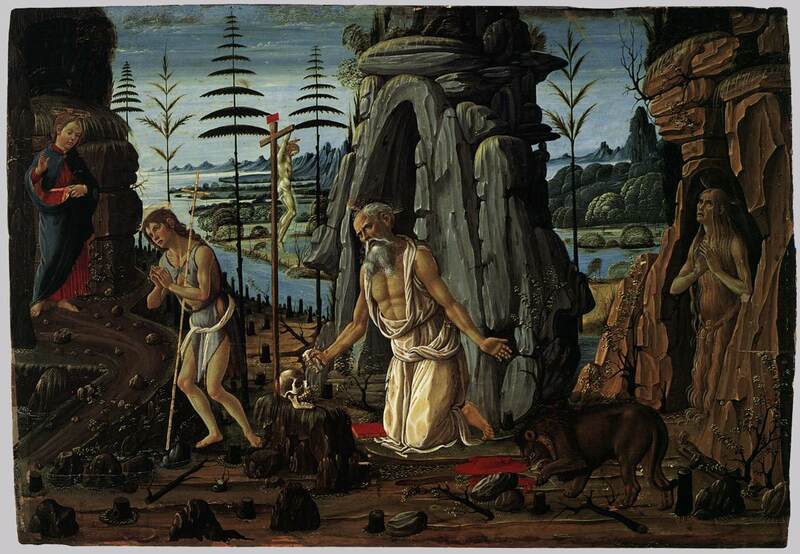 A contrary trend, however, shows St Jerome as an ascetic and penitent, praying in the desert, as he did indeed spend much of his life as a monk in the deserts of the Holy Land. 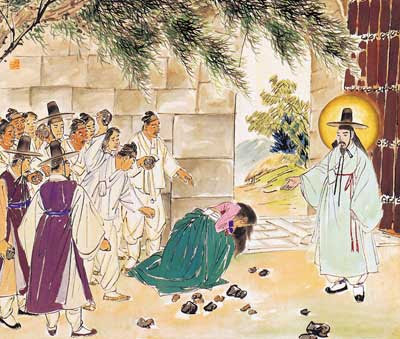 As evidenced by many of his writings, but especially by his fierce polemics against the errors of his times, Jerome was not the kind of man to do anything by halves; the apprehension of his character gave rise to the tradition by which he is shown beating his own breast with a rock as an act of penance. Pope Benedict XIV (1740-58) is said to have remarked on such a representation of the Saint, who also quarreled violently with several of his friends (including Augustine), “If it is true, that would be the only way you got into heaven.” The figure of Jerome the Ascetic corrects a tendency common among the learned men of the Renaissance, (Erasmus is a classic example), to disdain the Christian ideals of detachment and renunciation, a disdain which all too often degenerates into further disdain for “the ignorant”, and one’s fellow man generally. One of his contemporaries, Gian Pietro Bellori, described Domenichino’s Communion of St Jerome as follows: “Who could ever speak worthily and at great enough length of such a stupendous work, if one observes its drawing and expression? These are the parts that are unanimously considered the merits of Domenichino, over and above all other painters of this century.” He also reported that Nicholas Poussin, a much-esteemed French painter of the era who worked most of his life in Rome, “was ravished by its beauty, and used to set it beside Raphael’s Transfiguration… as the two greatest paintings that lend glory to the brush.” (Paintings in the Vatican, ed. Carlo Pietrangeli, p. 474) Another contemporary, Giovanni Lanfranco, famously accused Domenichino of plagiarizing the work from Agostino Caracci, a brother of his teacher, but was fiercely defended from this imputation by Bellori and Poussin among others. St Jerome was a figure at once important and difficult for the Protestant reformation. He was the only Father of the Church to whose authority the early Protestants could appeal in their rejection of the Deuterocanonical books of the Bible, (he is cited to this effect in the Articles of the Church of England), even though he himself did not hold his position against them consistently. John Calvin famously stated about St Augustine, “totus noster est – he belongs entirely to us”, (a typically gross exaggeration), and as noted above, Augustine praised Jerome as the most learned man of their age. But Jerome was also a fierce defender of many things rejected by the Protestants: devotion to the Saints and the cult of relics, the Papacy, asceticism and monasticism, celibacy and virginity. In Domenichino’s painting, therefore, an exemplary work of the Counter-Reformation, Jerome the Ascetic comes entirely to the fore, and there is no trace of Jerome the Scholar. His open robes reveal the body of an elderly man emaciated by years of fasts and long vigils. 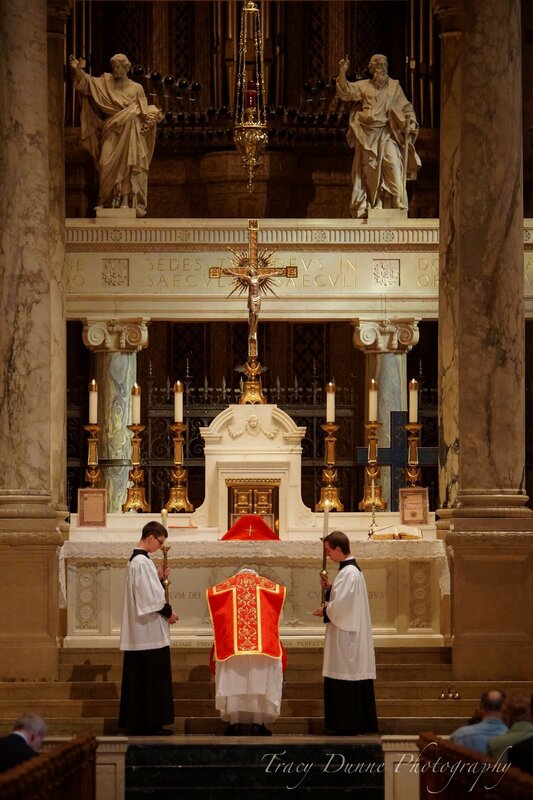 The robes themselves are cardinalitial red, representing the highest institutions of governance in the Church. A woman kneeling down beside Jerome kisses his hand, venerating him as a Saint. He himself gazes in adoration at the Host of the Viaticum which he is about to receive; Domenichino emphasizes its importance by making the background immediately around it very dark, and having several of the lines in the painting converge upon it. The priest who administers the Host is holding it in the traditional Catholic manner, between his canonical digits, and under a paten. The Catholicity, i.e., the universality, of the true Church founded by Christ is highlighted by the fact that the priest is assisted by a deacon in a Roman dalmatic (note the tassels on the back), and another wearing the crossed horarion and cuffs (called “epimanikia”) of the Byzantine tradition. St Jerome spent about 35 years of his life in Bethlehem, and died there on this day in the year 419; in his time, the city had Christian communities of both Latin and Greek speakers, especially after the sack of Rome in 410, when many Romans fled to the East. 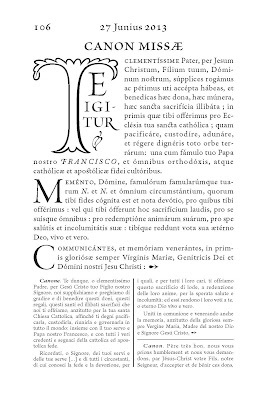 The Counter-Reformation often sought to proclaim, as it does here, the unified witness of East and West, the Latin Fathers and the Greek, against the theological innovations of the 16th century. Full details given in the poster below: click to enlarge. 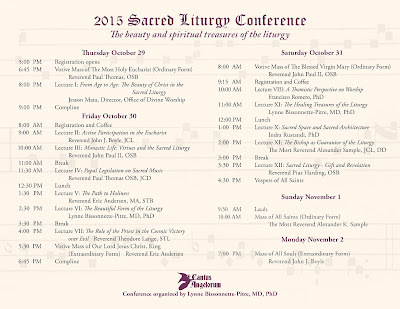 Please note that there will also be Pontifical Vespers in the evening of the same day. The traditional title of today’s feast is “The Dedication of St Michael the Archangel”, a term already found in the 8th century Lectionary of Wurzburg, the oldest of the Roman Rite that survives, and in the ancient sacramentaries. The Martyrology erroneously refers this feast to the dedication of the famous shrine of St Michael on Mt Gargano in the Italian region of Puglia, following a medieval tradition attested by William Durandus at the end of the 13th century. In reality, the title comes from the dedication of a church off the via Salaria, about seven miles from the gates of Rome, sometime before the 7th century, and remained in use long after the basilica itself fell completely to ruin. 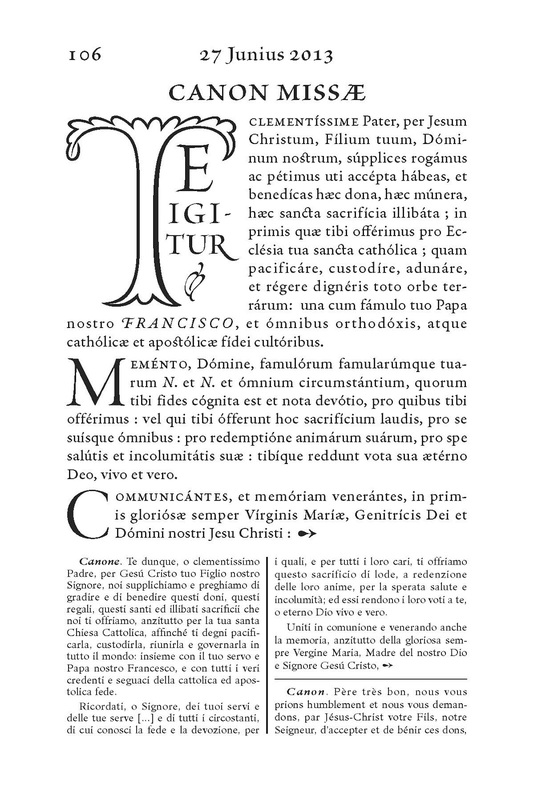 The traditional Ambrosian liturgy, which borrowed the feast from Rome, has in a certain sense actually preserved the memory of its origin better than the Roman Rite itself; not only does it use the Roman name, but it also takes several of the Mass chants, as well as the Epistle and Gospel, from the common Mass for the dedication of a church. 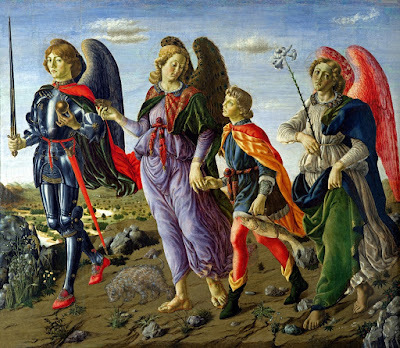 The Lauds hymn of the Office speaks in its first stanza of all the Angels, and in the following three of Ss Michael, Gabriel and Raphael, the only Archangels specifically named in the Bible. 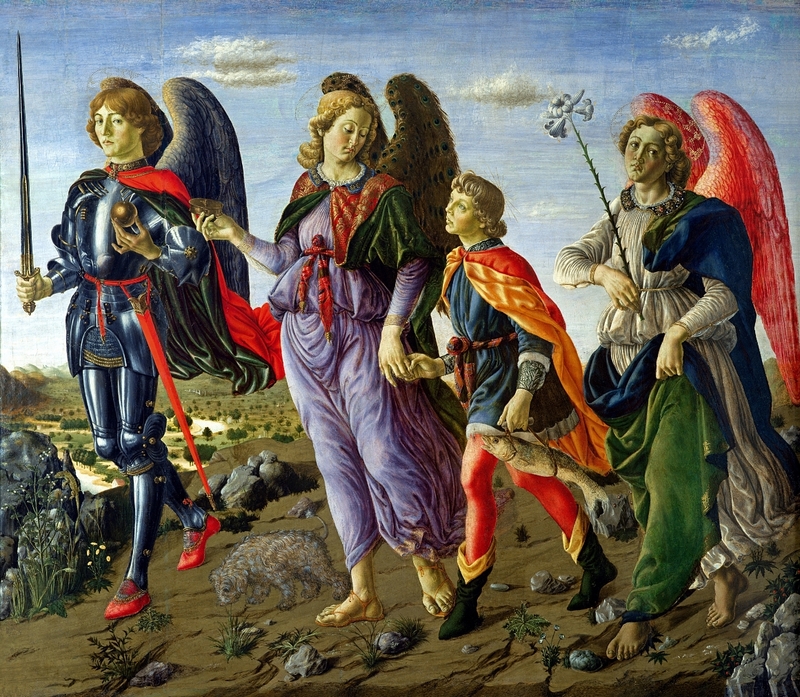 In the Greek version of the book of Tobias, however, St Raphael refers to himself as “one of the seven holy Angels, who present the prayers of the saints, and who go in before the glory of the Holy One.” (12, 15); this gave rise to a Byzantine custom of depicting seven Archangels standing together around the Lord. Many icons of this motif give names to the remaining four from various apocryphal sources; one is called Uriel, who is mentioned several times in the Book of Enoch which St Jude quotes in his epistle (verses 14-15). The names of the remaining three are not the same in all sources; in the 19th century Russian icon seen below, they are given as Jegudiel, Selaphiel and Barachiel. In the Middle Ages, many places imitated the Roman custom of celebrating a second feast of St Michael, commemorating the famous apparition which lead to the building of the shrine on Mt Gargano. In northern Europe, however, we find instead the feast of “St Michael on Mount Tumba”, the Latin name of the celebrated Mont-St-Michel, as for example in the Use of Sarum. 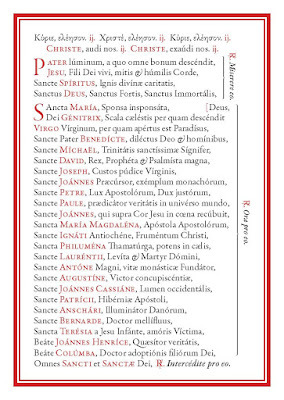 A votive Mass of all the Angels was already in use in the early ninth century, as attested by Alcuin of York, and is present among the votive Masses in every medieval missal. However, only very rarely does one find a feast of St Gabriel or of the Guardian Angels in the pre-Tridentine period; a Mass of St Raphael is sometimes found among the votive Masses especially to be said for the sick, but I have seen no reference to an actual feast day for him in the Medieval period. Pope Benedict XV, who reigned from 1914 to 1922, took a particular interest in devotion to the Angels. At the end of 1917, he raised the feast of St Michael to the highest grade, double of the first class, along with the March 19 feast of St Joseph. In 1921, he added the feasts of Ss Gabriel and Raphael to the general Calendar, the former on the day before the Annunciation, the latter on October 24 for no readily apparent reason. The feast of St Michael’s Apparition was removed from the General Calendar in 1960; in the post-Conciliar liturgical reform, Ss Gabriel and Raphael have been added to September 29th, and their proper feasts suppressed. Information about this upcoming liturgical event in New York City was provided to us by Mr Patrick O’Boyle. 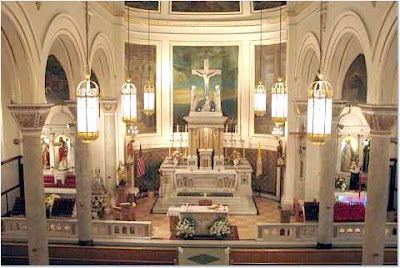 On Sunday, October 4 at 10:00 a.m., an Italo-Albanian Greek Catholic Divine Liturgy will be celebrated at Most Precious Blood Church, 109 Mulberry Street (between Canal and Hester Streets) in the Little Italy section of Lower Manhattan, sponsored by the Sts. Cosmas and Damian Society in honor of their patron saints. The society is composed of immigrants and the descendants of immigrants from the town of San Cosmo Albanese in Calabria, Italy. San Cosmo is one of the many communities formed in southern Italy by Albanian Christian refugees in the 15th century, who were seeking to escape the conquest and persecution of the Ottaman Turks. To the present day, a distinct Italo-Albanian culture continues in parts of southern Italy, with communities that retain many unique customs and dress, the ancient Albanian language and Byzantine Christianity. The Italo-Albanian Rite posses two Eparchies in Italy, at Lungro in Calabria and Piana degli Albanesi in Sicily, as well as the famous monastery of Grottaferrata outside Rome. Their priests can be married, and their liturgical language was Greek up until the time of the Second Vatican Council. In other major American cities where they settled, Italo-Albanian Greek Catholics were absorbed into Italian national parishes of the Latin Rite. Plans to form their own parishes outside Manhattan never came to fruition, due to the poverty of these immigrant communities and the apparent disinterest of many bishops. Italian-American Catholics of Italo-Albanian descent have begun working in recent years to reclaim their spiritual heritage. A renewed Italo-Albanian Greek Catholic Society of Our Lady of Grace was formed in New York to promote the Rite in the Northeast; a parish, Our Lady of Wisdom, was formed in Las Vegas under the Byzantine Catholic Eparchy of Phoenix, and occasional liturgies have been celebrated in New Orleans. In this spirit, the Sts. Cosmas and Damian Society has decided this year, on the occasion of their patronal celebration, to forgo the annual Latin rite Mass held at Most Precious Blood, and instead return to their ancestral tradition and sponsor the Divine Liturgy according to the Byzantine Rite. The Rt. Rev. Economos Romanos V. Russo will serve the liturgy in English (at the Society’s request) assisted by Subdeacon Alexei Woltornist. This is a very rare opportunity to experience the Italo-Albanian Rite that should not be missed. 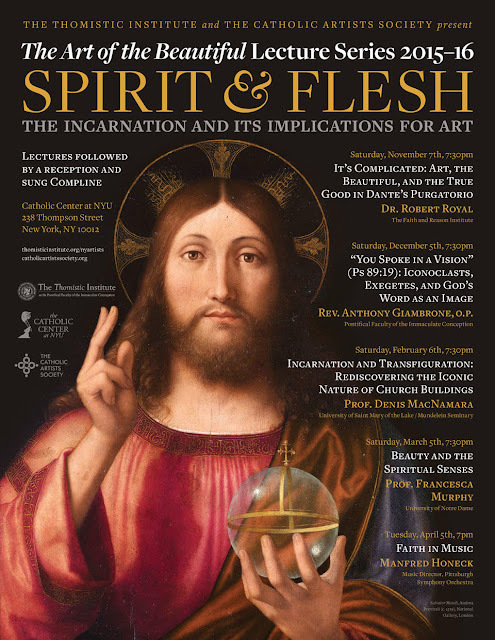 I have received the itinerary for the Catholic Artist Society speaker series in New York City for the coming year. Amongst the very strong line-up there are two speakers whom I have had contact with in the past. First is Denis McNamara who is always interesting when he talks about beauty and architecture. He has a deep understanding also of the form of liturgical art and how to place it in the right architectural setting. He is on the faculty of the Liturgical Institute at Mundelein. Second is Francesca Murphy whom I knew through Stratford Caldecott and her contributions to the journal Second Spring. I encourage all who can make it to attend all of the lectures on the list. I attach the poster. You can see it directly on the Catholic Artists Society Facebook page also. 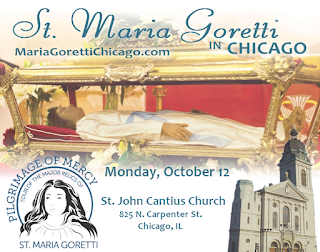 On Monday, October 12, the major relics of St. Maria Goretti (canonized in 1950) will be venerated at St. John Cantius Church in Chicago. Information is available here. 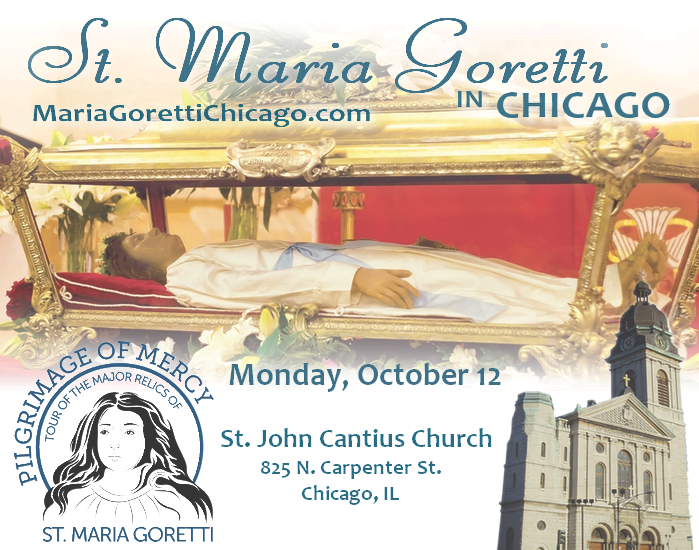 As a prelude to the “Year of Mercy,” those who venerate the relics of this young virgin-martyr will have the opportunity to experience the Mercy of God that St. Maria Goretti experienced when she forgave her murderer in her last breath. Me exspectant peccatores ut perdant me: ad praescripta tua attendo: omnis perfectionis vidi esse terminum: latissime patet mandatum tuum. Ps. Ibid., I Beati quorum immaculata est via: qui ambulant in lege Domini. V. Gloria Patri. Deus meus, eripe me de manu iniqui, de pugno improbi et oppressoris. V. A ventre matris meae eras protector meus. Alleluia, alleluia. V. Ps. 70, 6-7 In te speravi semper. Tamquam prodigium apparui multis; tu enim fuisti adiutor meus fortis. Alleluia. Ne tradideris viilturi vitam turturis tui, vitam pauperum tuorum noli oblivisci in perpetuum. Timor Domini ipse est thesaurus eius. 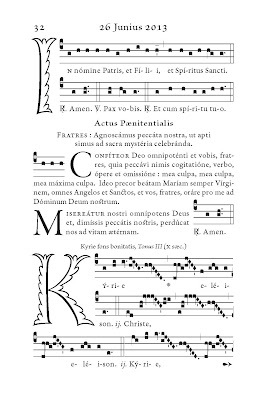 The Gregorian chant setting of these propers for the Feast of St. Maria Goretti (which are appointed to be used for her Votive Mass at St. John Cantius on October 12th) have proved difficult to locate. 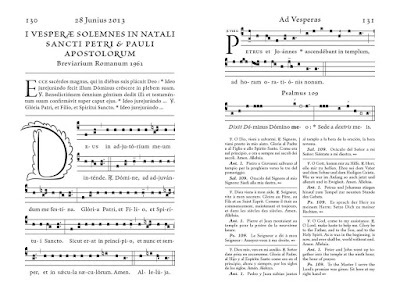 It seems that these Gregorian chant propers can neither be found in the 1962 Liber Usualis nor in the 1961 Graduale Romanum. (They are also not found in the 1974 Graduale Romanum.) 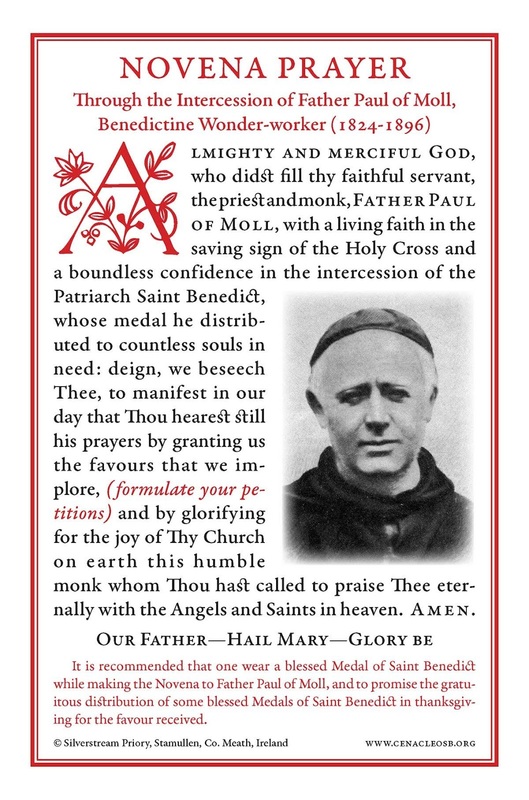 Because St. Maria Goretti’s spiritual formation was guided by the Passionists, one might hope that the Passionists, who fostered devotion to her, might have these proper Gregorian chants in their possession (perhaps in the archives of their congregation). If any NLM readers have access to the proper Gregorian chants for the Feast of St. Maria Goretti please contact Fr. Scott A. Haynes, SJC at St. John Cantius at 312.243.7373 x 111 or at music@cantius.org. Fr. 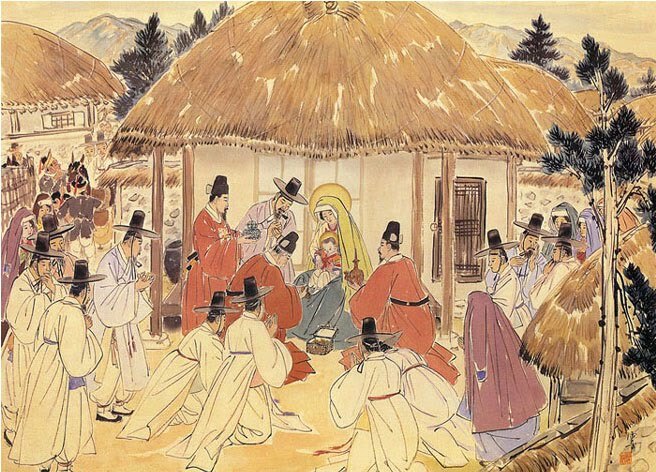 Lawrence Lew, O.P., of this blog has suggested that I republish this post since the question of Dominican practice in incensing was raised by a combox query after the article on the recent Dominican Rite Missa Cantata in the Dominican Central Province. Students of my province have also asked about this, so I think this summary of Dominican Thurible Etiquette is timely. I have occasionally commented that the Dominican and Roman practices concerning incense are often quite different. So I thought readers might appreciate an overview of traditional Dominican usage. The beautiful Gothic thurible to the right is virtually identical to the anniversary thurible at St. Albert the Great Priory in Oakland CA, our House of Studies. A. Occasions when Incense is Used. 1. 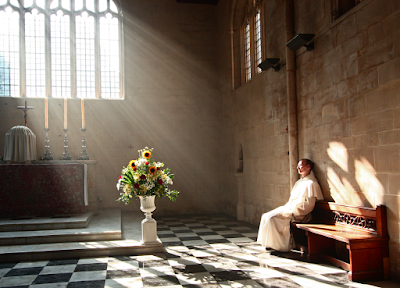 Although properly a Solemn Mass (with deacon and subdeacon) would normally be said every day in a priory with sufficient numbers, not all Solemn Masses use incense. Incense is used at the Gospel, Offertory, and Elevation on all Sundays and Third Class (previously Simplex) feasts and above. 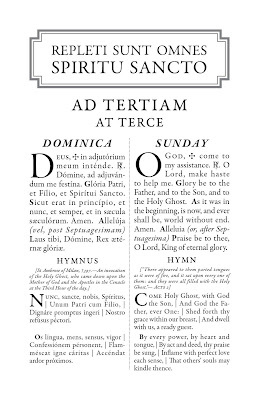 It is not used on ferials or at Requiems (except at the Absolution after Mass). 2. 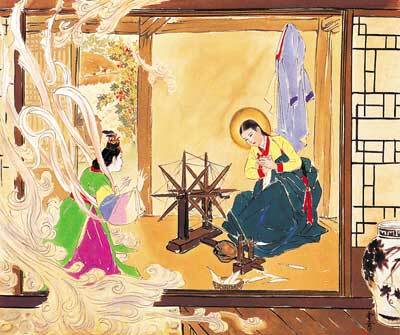 Incense is also used at Missae Cantatae on those days. In fact, a recognition of this practice was requested by the Order and received from the Congregation of Rites every five years up to Vatican II to settle doubts about this practice. Today incense is universally used. Although it is not required at Missae Cantatae. 3. The altar is traditionally incensed during the Gospel Canticle of Lauds and Vespers on those days as well. B. How the Thurifer Handles the Censer when Loading it. 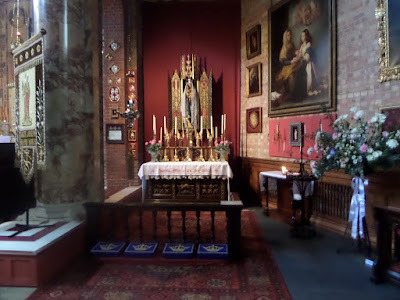 Although in parishes, perhaps because of the number of available altarboys, it was and is common practice for the thurifer to be accompanied by a boat-bearer, this was not the case in the conventual Mass. And, as the priest in our rite never handles the spoon, this required certain techniques that seem complicated but are actually very simple.The presence of a boat-bearer actually complicates the handling of incense. This method is used (at the sedilla) in preparation for the Gospel and at the Epistle Side of the altar in preparation for the Offertory. 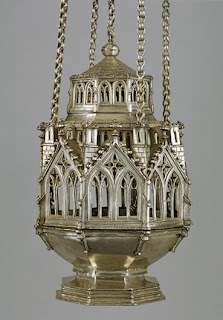 The thurible used must be a conventional one with a cover that can be pulled up the three outside chains using a center chain. When entering before the Gospel, the thurifer holds the chains near the disk (or the disk ring) with the little finger of the left hand; with his left forefinger and thumb he holds the boat (which must have a little pedestal base). With his right hand he holds the chains just above the cover, holding the thurible at about waist height on his right side. This is how he always holds the thurible when it is not in use: it is never carried or held with the chain at full length, except during the singing of the Gospel, as will be explained below. 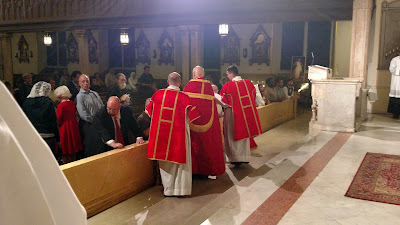 As the Alleluia or Tract begins, he approaches the priest. He lowers the thurible and, with his right hand, pulls up the center chain ring and hooks it on the ring finger of his left hand. This will raise the thurible cover about four or five inches: more than enough to get access to the coals. Then, with his right hand, he grasps the four chains just above the cover and raises them up so that he can grasp them with the last three fingers of his left hand. The open thurible is now at waist height, and the thurifer's right hand is free. With it, he opens the boat, and takes out a spoonful of incense. He offers this to the priest, saying, "Benedicite." 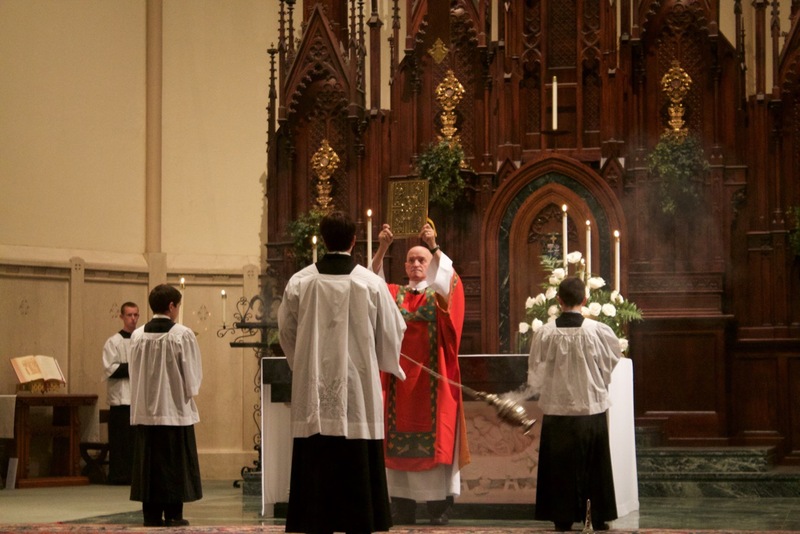 The priest blesses the incense, the thurifer responding "Amen." The thurifer then puts the incense in the censor, places the spoon back in the boat, closes the boat, and takes the chains off the three fingers of the left hand, letting the chains extend completely. He then takes the center chain ring off the left ring finger and lowers the cover of the thurible. He then takes the chains just above the cover with his right hand, so as to assume the position for holding or walking with the thurible. One should note that the sliding ring around the chains, if present, is never pushed down onto the cover of the thurible. It remains at mid-point of the chains at all times. If it is pushed down, these movements would be hindered or impossible. This sounds complicated, but once the movements have been executed a couple of times, nothing could seem more natural. C. Other Rules Governing the Thurible. 1. When the thurible is carried, whether there is incense lighted in it or not, it is never held with the full chain extended. It is held or carried as explained above. This means that the chains are in the proper position if the thurible is to be given to a major minister to hand to the priest. If the thurifer is to hand the thurible to the priest himself, he must reverse his hands first--so that the priest will receive the thurible correctly oriented for use. This manner of holding the censer renders it less visible and mobile, and so less distracting. I also solves the usual awkwardness of genuflecting with the chain fully extended. 2. The thurifer never swings the censer back and forth (supposedly to keep the coals burning) as is usually done in the Roman Rite. Again, this prevents the object from distracting attention from the liturgical activities in process. 3. There is only one occasion when the thurible is held is held with the full chain extension (and again by the left hand). This is during the chanting of the Gospel. And, again, there is no swinging of the thurible. This would distract attention from the Gospel. 4. 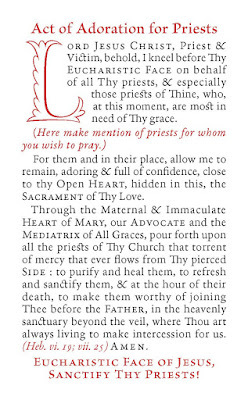 When the thurifer (or priest or deacon) incenses, this is done without any swinging of the censer during the ductus. Thus there is no chain-clanking. The motion is straight up and down, entirely silent. Dominican incensing is always silent: it should not distract from the music or the liturgical actions it embellishes. 5. The incensing of the deacon and subdeacon, as well as of the two acolytes, is done by the thurifer during the Preface. The minsters face him in their positions: he gives the deacon two lifts of the censer; the subdeacon, one lift; and each acolyte, one lift, the senior acolyte first. He then incenses each friar in choir: the provincial receives three lifts; each priest, two lifts; other friars, one lift. Our liturgical books do not mention the incensing of the people because, as ours is a monastic rite, it is assumed they are absent. But it is common in parishes to give each side of the congregation one lift, and the choir in the loft one life. The image to the left shows the thurifer in position for the Preface. The photo shows Fr. 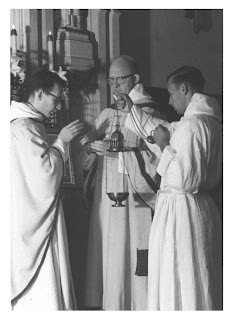 Joseph Fulton (RIP) celebrating Mass at St. Albert the Great Priory in the mid-1950s. D. Particularities in when incense is used in the Solemn Mass. 1. 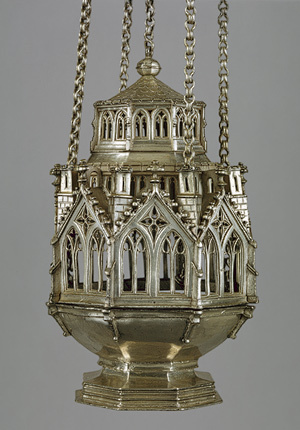 The thurible is NEVER carried in the entrance or exit procession. Nor is the Cross ever carried in these processions. The thurifer, boat-bearer, and crucifer do NOT participate in these processions: they sit in the sacristy (which is preferred) or sit uietly and unobtrusively in the sanctuary on the Gospel side until they have functions to perform. For the thurifer, his first function is at the Gospel. 2. There is no incensing of the altar during the Officium (i.e. 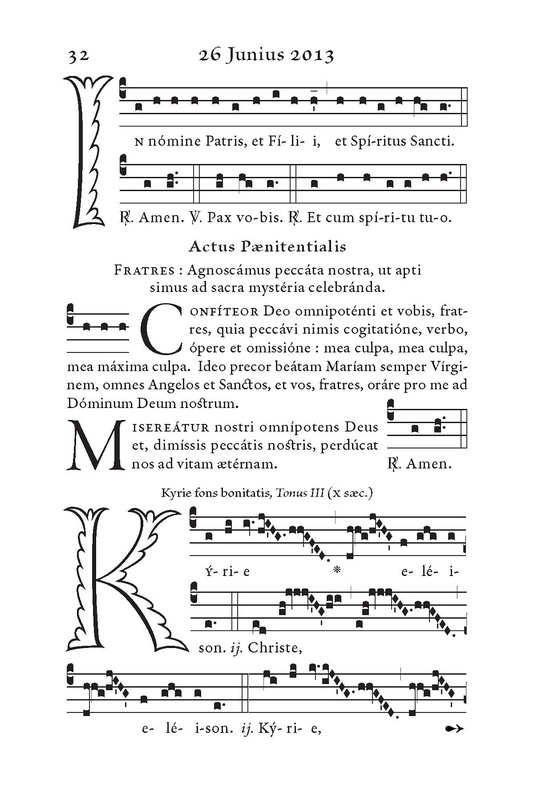 Introit) chant. 3. The priest directs the preparation of the censer for the Gospel while seated at the sedilla (the bench for the three major ministers) as explained above. The priest never touches the spoon. The thurifer stands throughout this ceremony. 4. 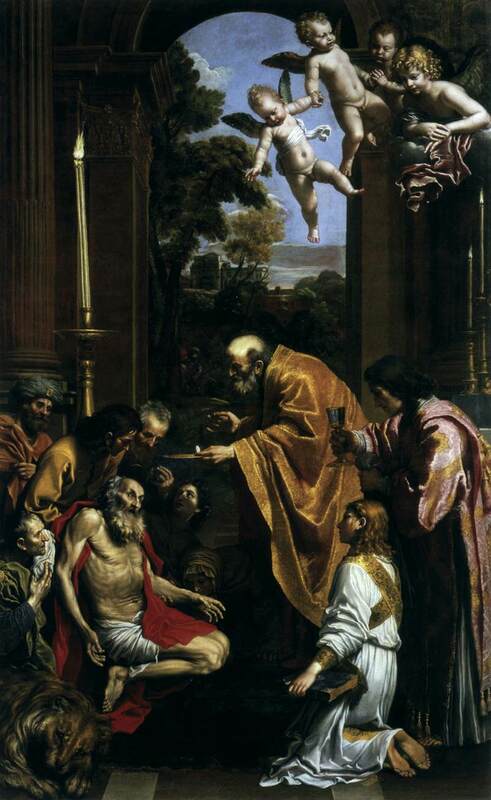 The deacon incenses the Gospel book with three simple, silent, lifts of the thurible. 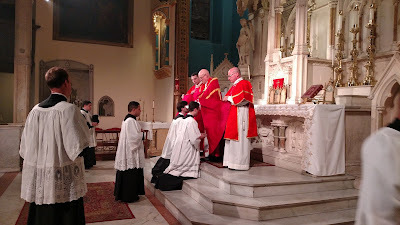 He then hands the incense back to the subdeacon, who hands it back to the thurifer. 5. The incensing at the Offertory is simpler than in the Roman Mass. The deacon offers the incense to be blessed and then hands the priest he censer. With it, he makes a single Sign of the Cross over the gifts. After this he raises and lowers the censer three times before the host and chalice (never lifting higher than his shoulder). If the tabernacle or Cross (or both) is present, he incenses it (them) with one set of three lifts. If there are reliquaries, he makes a moderate bow, and from the center, without moving, he incenses as a group those on the Gospel side with two lifts, then those on the Epistle side with two lifts. If there is only one reliquary on the altar, he incenses it with two lifts. Making a profound bow, he then incenses with three lifts above he altar as he moves to the Epistle end, once toward each candlestick. He lowers the censer and returns to the middle. In the same way he incenses the top of the altar while while going to the Gospel end. 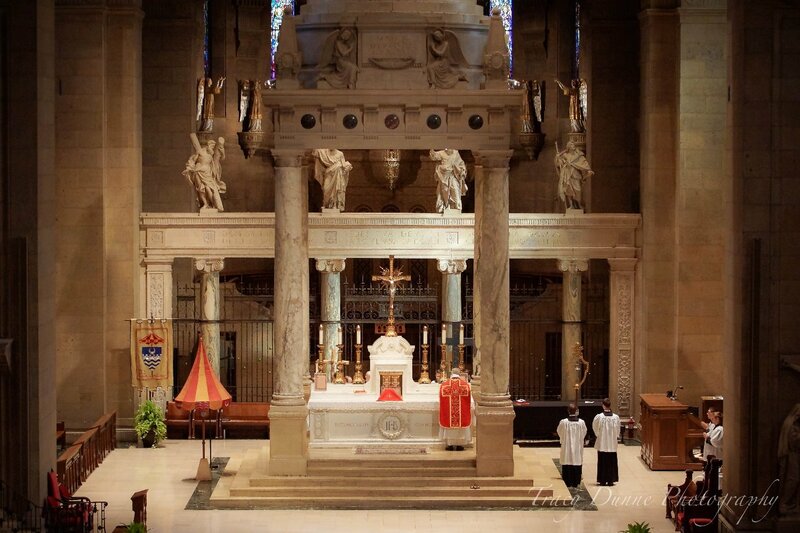 Then then returns incensing the lower part of the altar three times as he returns. 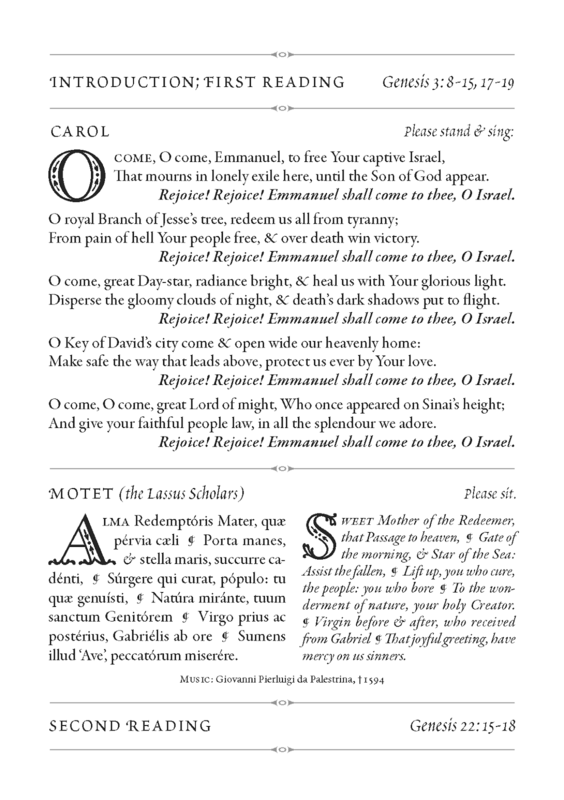 He stops before the Cross to make a profound bow, then completes the three lifts of the lower part of the Epistle side. On arrival there he surrenders the thurible to the deacon. 6. The deacon incenses the priest (using three lifts), when he has finished incensing the altar at the Offertory. As he does the three lifts, the deacon lifts the front of the priest's chasuble so as to incense under it---this prevents any sparks from landing on the chasuble and damaging it. The incensing of the other ministers is done by the thurifer during the Preface, as already explained. At the left you can see the deacon (Fr. Paul Raftery) holding up the chasuble and incensing as Fr. 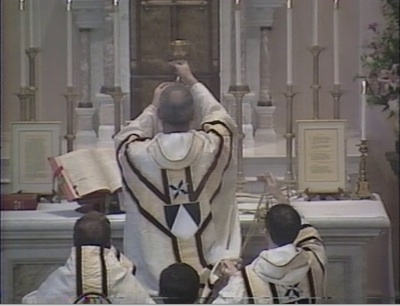 Anthony-M. Patalano elevates the chalice during Solemn Mass at Holy Rosary Church in Portland OR in the 1990s. 7. Just before the Consecration, the thurifer, who is kneeling between the acolytes at the foot of the altar, loads the censer with unblessed incense. He then passes it up to the deacon, who incenses the Sacred Species continuously during each elevation. He then passes it back to the thurifer who rises, genuflects and leaves for the sacristy, as he has no functions during the rest of Mass. 1. The thurifer stays in the sacristy or (more properly) sits in the sanctuary until the priest prepares the chalice after the Epistle. As the priest begins to pass to the north side of the altar for the Gospel, he turns and faces the Epistle side of the altar. This signals to the thurifer to arrive and come up the front of the altar steps to meet the priest at the center as he passes over. 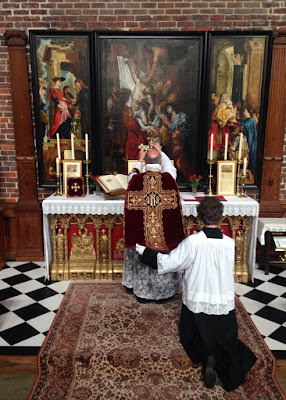 (See the positions of the priest and thurifer in the image of the Solemn Mass Offertory above.) He there receives the blessing of the incense for the Gospel, descends and leads the acolytes around the corner of the steps for the Gospel. 2. 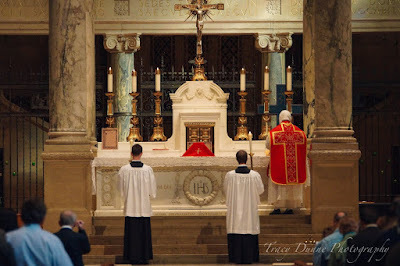 At the Offertory, when the priest makes a half-turn, as at the Gospel, the thurifer comes up the front of the altar steps with the censor for the priest's blessing of it before he incenses of the altar. 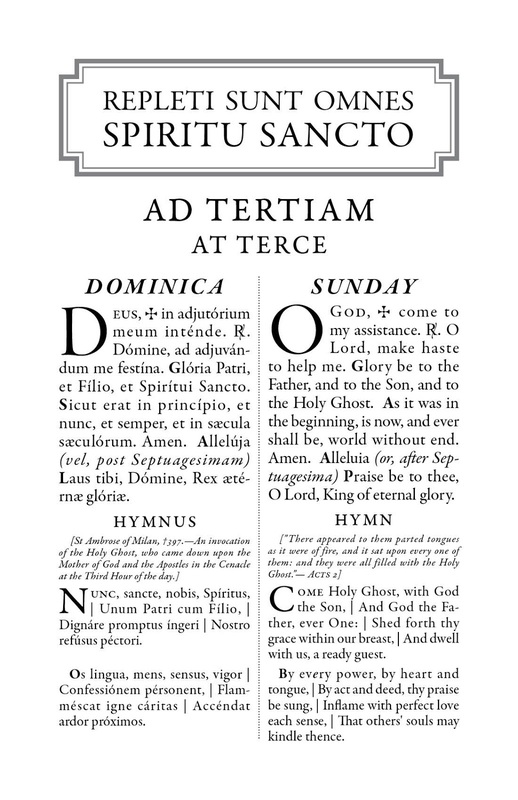 The thurifer then goes and stands at the Epistle side. The incensing over, the thurifer receives the censer back, incenses the priest with three lifts, and goes to the center of the sanctuary and waits. 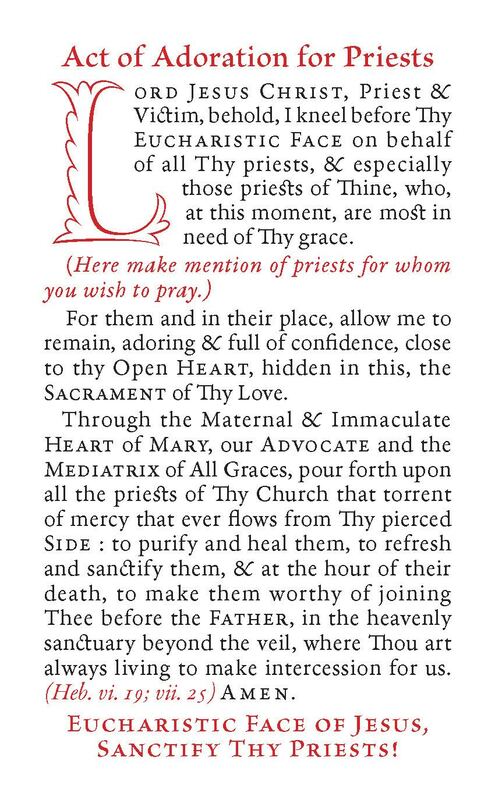 He incenses the acolytes in order of seniority with one lift, the community (using the number of lifts explain for the solemn Mass, and possibly the people, all during the Preface, as at Solemn Mass. 3. 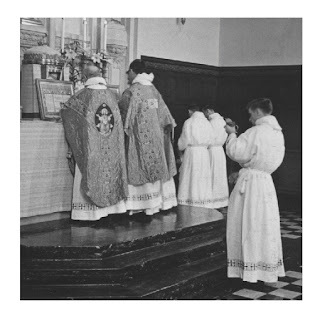 The Thurifer then stands in the center, when the acolytes are to kneel in the canon, kneels in center of the first step as the acolytes ascend for the elevations. He puts unblessed incense in the thurible if needed. He then incenses the elevations continuously as the deacon would at Solemn Mass. His work finished, he rises, genuflects and departs to the sacristy. 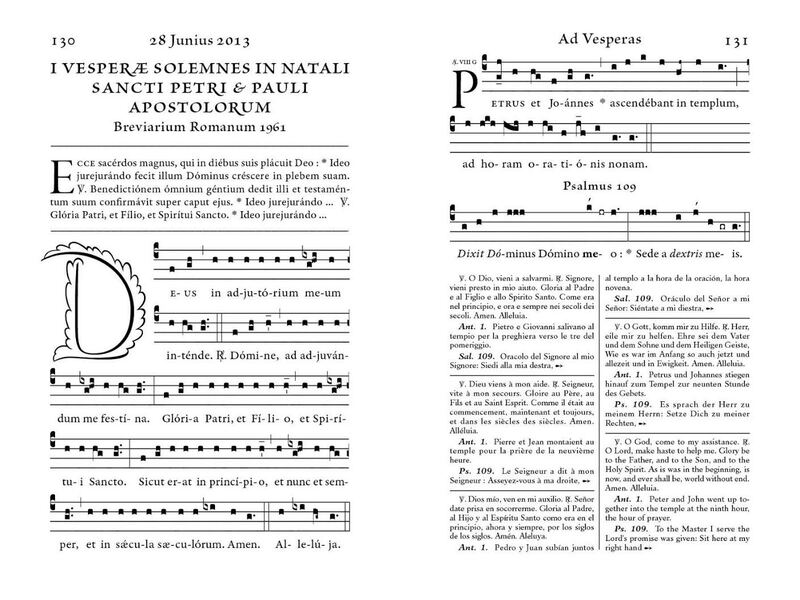 This past July, we published an interview with our own Henri Adam de Villiers, director of the Schola Sainte Cécile, which will provide the music for the upcoming Populus Summorum Pontificum pilgrimage to Rome. The Schola Sainte Cécile will be joined by the English ensemble Cantus Magnus, lead by Mr Matthew Schellhorn; in this interview with the organizers of the pilgrimage, he describes his group’s contribution to the liturgies, which promise to be absolutely outstanding. 1) Can you introduce yourself – your background and your current activities? I am a musician living in London, originally from Yorkshire. I went to school in Manchester and then read Music at Cambridge, where I still work. I am a pianist by training and my professional activities include teaching and giving recitals on my own and with others. Singing has always been part of my life and is the heart of my music making, even at the piano. After I converted to Catholicism in 1999, I realised that the Sacred Liturgy needed to be serviced with a much higher standard of music, both in terms of performance and repertoire. The traditional liturgy and the movement surrounding its promotion provides rich opportunities for chant and polyphony, and it is a great privilege to be involved with so many celebrations in the UK and further afield. 2) You will be in Rome in late October for both the General Assembly of Una Voce and for the pilgrimage Summorum Pontificum. Can you explain the musical programme that you will perform during these two events? My colleagues and I will be providing the music for several celebrations, including the Eucharistic Adoration in San Lorenzo in Damaso (before the procession to St Peter’s) and for the Sunday Mass in the historic church of Santissima Trinità dei Pellegrini. I wanted to programme works that highlight our British provenance and the international nature of the events. So, we have music by Robert Parsons and William Byrd, both English composers who worked at the Chapel Royal and were most probably teacher and pupil respectively. We also have music by the great English Catholic composer Sir Edward Elgar, Master of the King’s Musick from 1924–34; his music is considered nowadays the epitome of “Englishness” or “Britishness”, but in fact owes more to continental Europe. 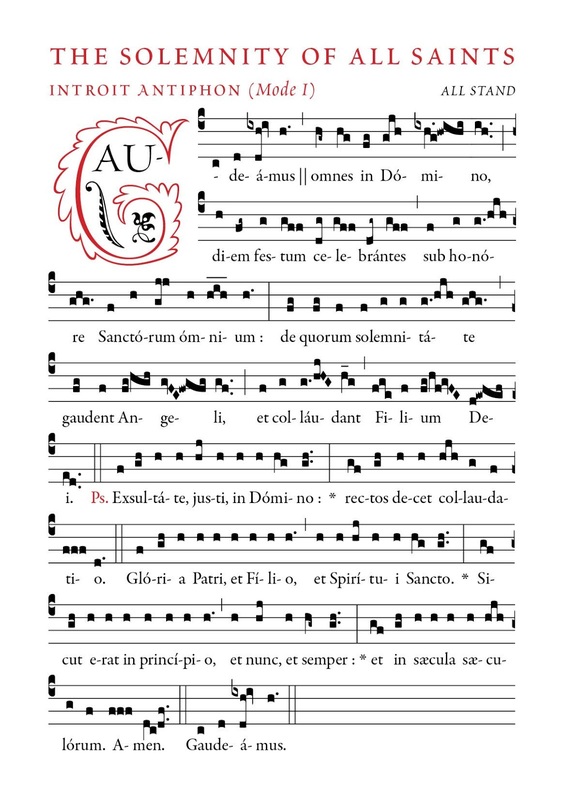 I have also included a motet by my friend Sir James MacMillan, a potent musical voice who does much to represent Sacred Music and who is a Patron of The Latin Mass Society of England and Wales, which is sponsoring our work in Rome. To reflect the international dimension, I have programmed works by Josquin, Lotti, Viadana, Victoria, Palestrina, Mozart, Robledo and Franck. This will be a grand tour of Sacred Music! 3) You have assembled a choir especially for this purpose: can you introduce it to us and tell us if it will continue in the future? 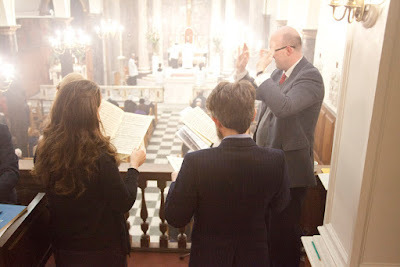 I founded Cantus Magnus as a small professional vocal ensemble in 2011 to fulfil the objective of performing Sacred Music in the context for which it is composed – the worship of God during Solemn Mass. We give no concerts, make no recordings. I do not believe in hearing Sacred Music in the concert hall. We have been fortunate to be supported by the Latin Mass Society, assisting with its events including national pilgrimages and cathedral celebrations. Since 2012, we have provided the music for the Sacred Triduum held at St Mary Moorfields, London, where we also gave what we believe was the UK premiere of the Tenebrae Lamentations and Responses by Italian cleric and composer Pietro Amico Giacobetti (fl. 1579–1616). I very much hope this work will continue, allowing the faithful to hear such beautiful music in the manner it was intended. 4) What is the link between your musical calling and Catholic faith? Good music can draw people into the mystery of worship and therefore I see being a musician as primarily a vocation of service. Beyond that, I can only explain in general terms. I am a Catholic musician, but all Catholics are musicians in the sense that our patrimony includes music because music is an essential human quality. As Cardinal Ratzinger explained: "When man comes into contact with God, mere speech is not enough.”. Or, to use St Augustine’s phrase: “Cantare amantis est” – singing is a lover’s thing. This truth, then, is the link for me and for others. We sing because we have faith; and we have faith so we sing. 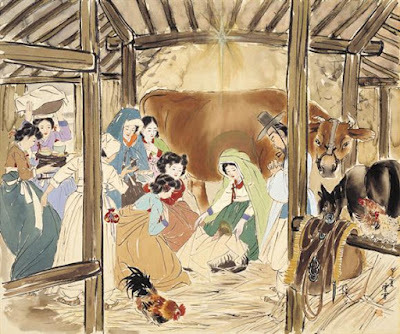 The website ChurchPop recently published an article about a series of twenty paintings of the life of Christ, by Korean artist Woonbo Kim Ki-chang. 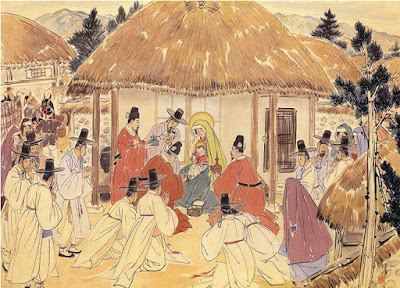 The style and the settings are unmistakably Korean, a beautiful example of the best kind of inculturation, that by which the culture of a people and a nation are put to the service of the Gospel, while retaining what is good in their proper traditions and characteristic. 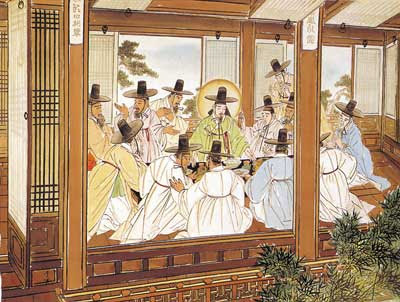 As we have noted on other occasions, recent and not so recent, in many parts of Asia it is considered dishonorable for a man to appear in public without a hat. Notice therefore how the Magi at the stable and the adult Christ (among others) are shown with hats. When, however, we come to the trial of Christ, the scourging, the carrying of the Cross, and the Crucifixion itself, He is shown without a hat; the hat then reappears at the Resurrection and Ascension. This past Saturday, Fr. 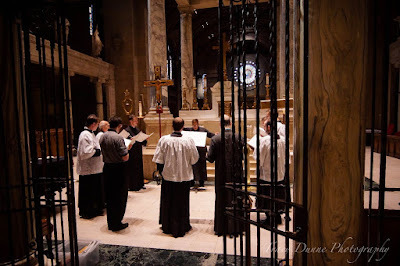 Dominic Holtz, OP, a professor at the Angelicum in Rome (Pontifical University of St. Thomas Aquinas) celebrated a Dominican Rite Missa cantata for the feast of St Januarius and Companions at the Basilica of St Mary in Minneapolis, Minnesota. 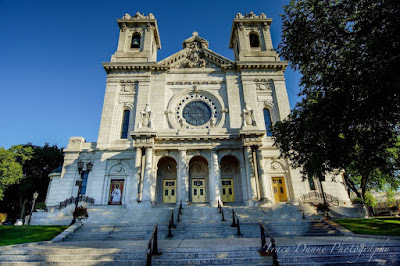 Our thanks once again to the ever-generous Tracy Dunne of Tracy Dunne Photography for sharing with us these photographs, which illustrate very nicely some of the ways in which the Dominican Mass differs from the Roman. 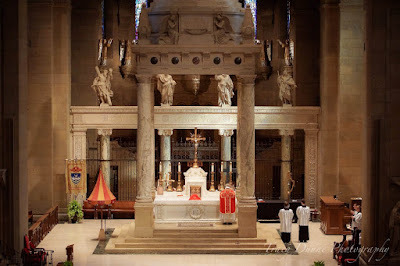 Note how the acolytes face in the same direction as the priest when standing next to the altar, as opposed to the Roman custom by which they face the priest. The same is seen a few photos below. We recently received this information about the new location of the FSSP Apostolate in South Bend, Indiana, from the parish priest, Msgr. John C. Fritz. NLM joins the Fraternity in thanking His Excellency Kevin Rhoades, bishop of Fort Wayne - South Bend, for this generous pastoral provision for the faithful in his diocese attached to the traditional Mass. 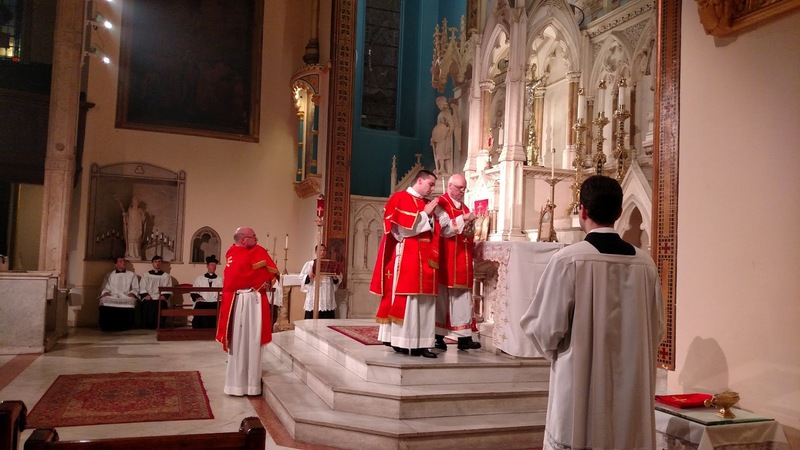 The Mother Theodore Guerin Latin Mass Community had been celebrating the Traditional Latin Mass as guests at St. Patrick’s Parish in South Bend. As the small community continued to thrive and grow, its chaplain, Msgr. John C. Fritz, FSSP began to think that perhaps the group was ready to find a home of its own. As often happens, Divine Providence stepped in, and the opportunity came through a phone call from the local bishop. Bishop Kevin C. Rhoades of the Diocese of Fort Wayne South Bend called to ask Msgr. Fritz how he would feel about relocating his community to St. Stanislaus Parish in South Bend, thereby placing the parish under the care of the Priestly Fraternity of St. Peter. Msgr. Fritz called a ‘town hall’ meeting of his community where the proposal was unanimously and joyfully accepted! Msgr. Fritz went home to pack his bags in order to prepare to move from Fort Wayne to South Bend, in order to take up residence in the rectory of St. Stanislaus Parish as its new pastor. The Traditional Latin Mass was resumed at St. Stanislaus on September 8, 2015, the Feast of the Nativity of the Blessed Virgin Mary, and will continue regularly on Sunday mornings at 10:00 am. Msgr. Fritz warmly welcomes everyone in South Bend and the nearby areas to come and experience this beautiful ancient liturgy. 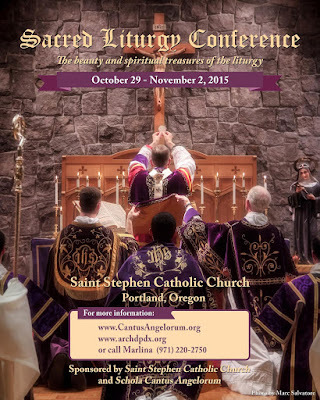 We will celebrate a Solemn High Mass on Sunday, September 27, 2015 at 10:00 a.m. with guests Fr. Gerard Saguto, FSSP and Fr. Simon Harkins, FSSP. All are welcome to attend. 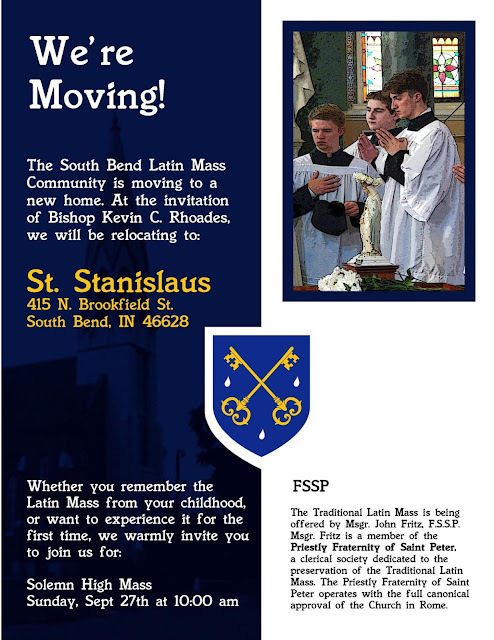 The Fort Wayne – South Bend Diocesan Newspaper, Today’s Catholic, recently did a feature story on the changes taking place at St. Stanislaus, and the South Bend Tribune also published an informational piece explaining what people can expect when they attend the Latin Mass. Check out either of these great articles or the parish website (http://ststanparish.com/) to learn more! 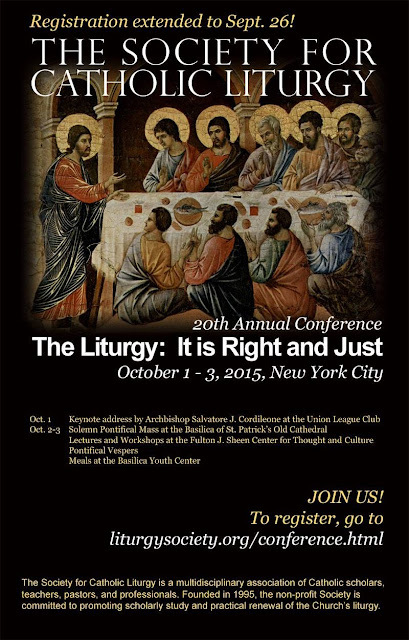 The Lumen Christi Association of New York: Pro Fide et Cultura is sponsoring an event to benefit the Benedictine Monks of Norcia, Italy on October 7, 2015 at the New York Athletic Club in Manhattan from 5:30 - 8:00 pm. 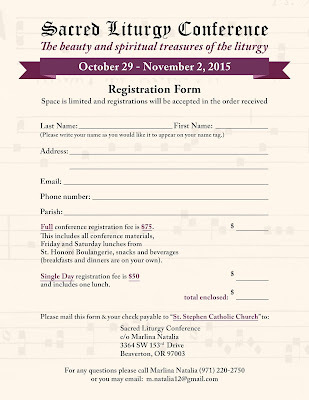 The guest speaker will be Catholic author and NY Times op-Ed columnist Ross Douthat. The title of his talk is "Religion and the Fate of the West: Being Catholic in a Secular Age". 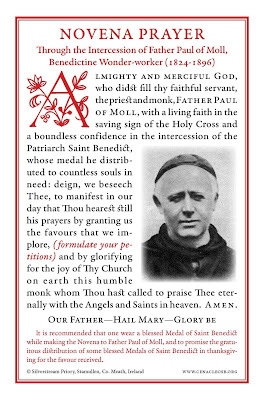 The founding prior of the monastery, Fr. Cassian Folsom, will also be giving a brief presentation on Monastic Life in Norcia and the Restoration of Christendom - Worship, Work and Art. Please visit www.lumenchristiny.com for more details and payment options. All proceeds for this event will be donated to the Monks of Norcia Foundation. Sept. 26th is the new deadline. The Most Reverend Salvatore J. Cordileone, Archbishop of San Francisco, will deliver the keynote address: “We Are Bound to Give Thanks to God Always: Worship That is Right and Just” at the Union League Club on Thursday, October 1. 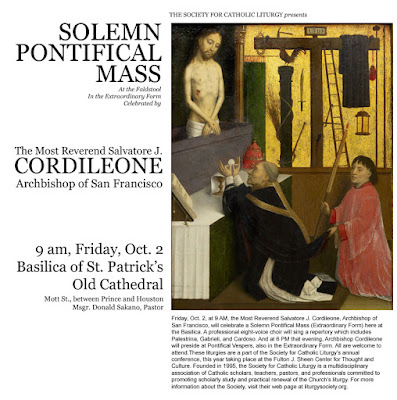 And on Friday, October 2, he will celebrate a Solemn Pontifical Mass (Extraordinary Form), accompanied by a sixteen-voice choir, at the historic Basilica of St. Patrick's Old Cathedral. 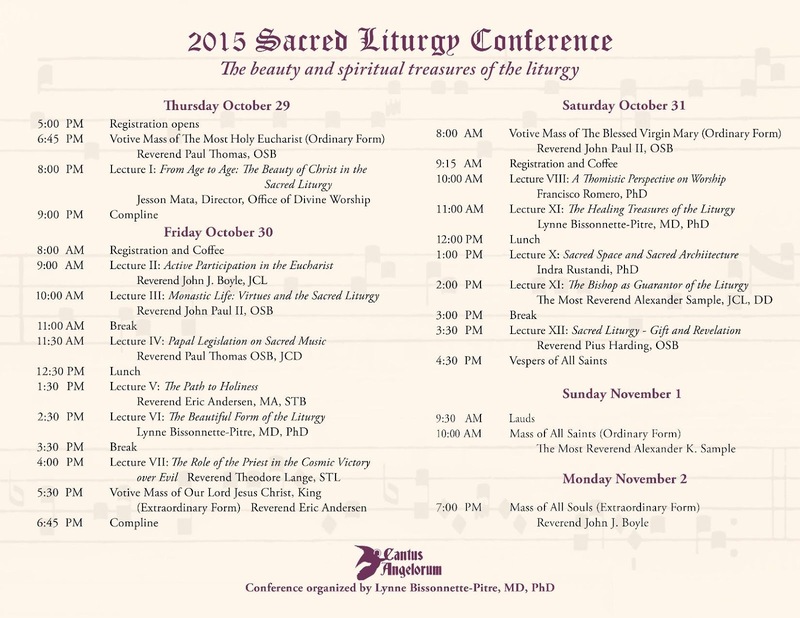 Two days of scholarly lectures follow at the Archbishop Fulton J. Sheen Center for Thought and Culture. 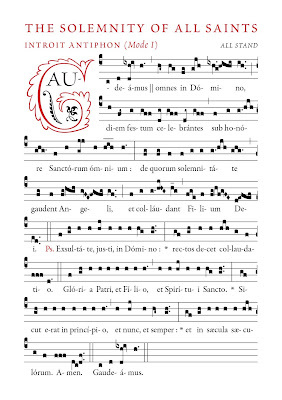 Topics range from the justice of worship in St. Thomas Aquinas to the styles and hierarchies of Gregorian chant melodies. The Pastoral Track of the conference, held at the Basilica Parish House, will offer practical workshops for parish and diocesan personnel—everything from financing a parish music program, to liturgical preaching, to "unwreckovation." Among the other beautiful liturgies to be offered, all free and open to the public, Archbishop Cordileone will preside Friday evening at Pontifical Vespers (Extraordinary Form), again accompanied by a professional choir. 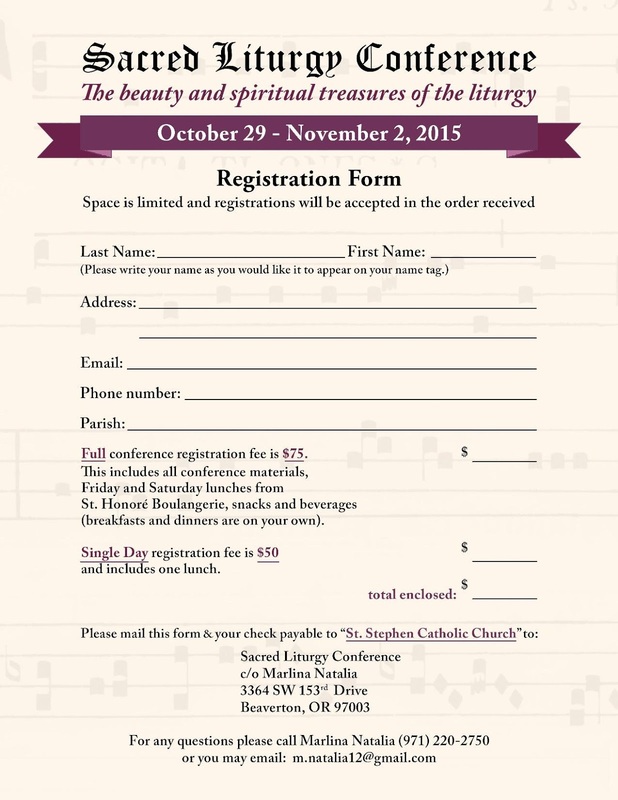 To see the full conference schedule, and to register, go to: http://liturgysociety.org/conference.html. Andrew Chandler & Charlotte Hansen (eds. 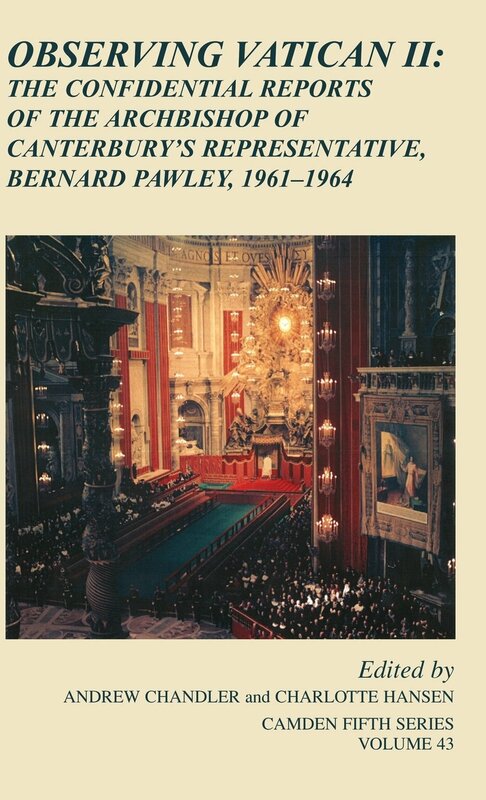 ), Observing Vatican II: The Confidential Reports of the Archbishop of Canterbury’s Representative, Bernard Pawley, 1961-1964 (Camden Fifth Series, 43; Cambridge: Cambridge University Press, 2013). Hardcover, 426 pp., cover price £45.00/$80.00, ISBN 9781107052949. 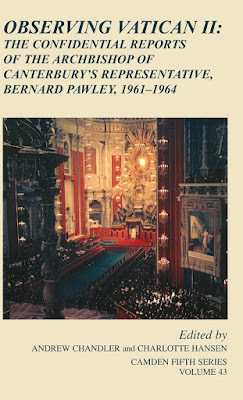 This volume in the Royal Historical Society’s well-respected Camden Series publishes, for the first time, the confidential reports about the Second Vatican Council made by the Anglican Canon Bernard Pawley to the Church of England’s Council on Inter-Church Relations. It takes its place alongside other recent English-language publications of diaries, journals and memoirs that cover Vatican II in whole or in part, such as Henri de Lubac’s Vatican Council Notebooks: Volume 1 (Ignatius Press, 2015), Yves Congar’s My Journal of the Council (Liturgical Press, 2012), and The Memoirs of Louis Bouyer (Angelico Press, 2015). The main body of Observing Vatican II reproduces large sections of the 167 reports Pawley wrote from April 1961 until the end of the Council’s third session in November 1964 (Canon John Findlow wrote the reports for the fourth session). As the editors admit, extensive cutting has been necessary to produce a book that fits within the scope of the Camden Series — Pawley’s reports encompass around 240,000 words, which would require a book at least twice the size (and probably the cost!) of this one. But even given these limitations, we still have 400 pages of exceptionally interesting material. Not only did Pawley write notes and summaries of the speeches given by the Council Fathers (in a similar manner to de Lubac’s Notebooks), but he also recorded the meetings of the Protestant and Eastern Orthodox observers. The first section of reports (pp. 33-132) also has particular interest for its recording of the period immediately before the Council, from April 1961 to October 1962, in which Pawley details his various interactions with, among others, the then Mgr Johannes Willebrands of the Secretariat for Christian Unity, as well as members of the British Catholic hierarchy and the Roman Curia. For the most part, the suggestions in the ‘Schemata’ for bringing up-to-date the Liturgy of the Roman Church are eminently reasonable and acceptable by us. As the Bishop of Ripon [John Moorman] remarked, ‘If they go on like this, they’ll find they’ve invented the Church of England.’ We often comment that the general principles are similar to those of the Preface to the Book of Common Prayer. The [observers’] meeting was then electrified by the principal Russian observer [Vitali] Borovoj, who, with many dramatic gestures, then got up and said that for the Orthodox the relations between Scripture and Tradition presented no problem. They had always had an ‘orthodox’ doctrine. At this point the meeting broke up. In discussion about [the schema De oecumenismo] with responsible members of the Secretariat, we get the impression that the text of the Schema as it stands is the result of a long struggle with conservative elements on the Theological Commission, etc. and represents an optimum of what we can expect. We should therefore prepare ourselves and our public not to be disappointed if certain positions at present occupied are heavily attacked and even lost. Some of the texts (e.g. that on permission for corporate prayer) are deliberately vague, in the hope that they will be able to be given a favourable context later. One slight downside is that the book’s introduction unfortunately relies too much on the Bologna school’s view of Vatican II and the historical period leading up to it — better known as the ‘hermeneutic of rupture’ or ‘Vatican II as event’. However, this only takes up the first twenty pages, and thus is not much of an issue. We are fortunate enough to be living in a time when these sorts of confidential reports, diaries, memoirs and other such personal recollections of the Council are being published, and with increasing frequency. However, unlike most of these recent publications, Observing Vatican II is written from the viewpoint of a Protestant (Anglican) observer. For those who have an interest in the history of Vatican II, this book comes highly recommended, and at the time of writing can be found for substantially less than the cover price online from various outlets. As one who has made hundreds of booklets, pamphlets, "worship aids," prayer cards, signs, and posters over the years, I have invested a lot of time learning how to make these simple items look beautiful. 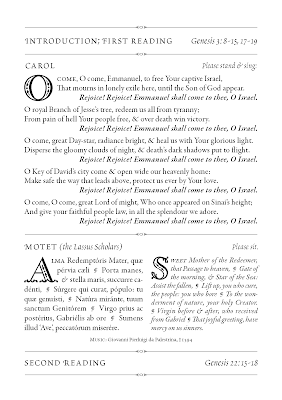 Fonts, styles, images, colors, borders, ornaments are all taken into account, the moreso as the occasion is more solemn. My attitude is that of Eric Gill and others who considered nothing so pedestrian or trivial that it should not be dignified by attention to detail, care in presentation, creativity in approach, and permanence of quality. I would imagine that similar thoughts prevail among the readership of NLM. 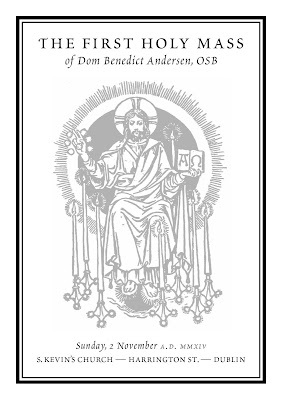 It is therefore a special delight to be able to share with you some examples of the extremely fine typesetting work of Dom Benedict Andersen, O.S.B., of Silverstream Priory, whose "Litany for the Holy Father" I was able to present two weeks ago. 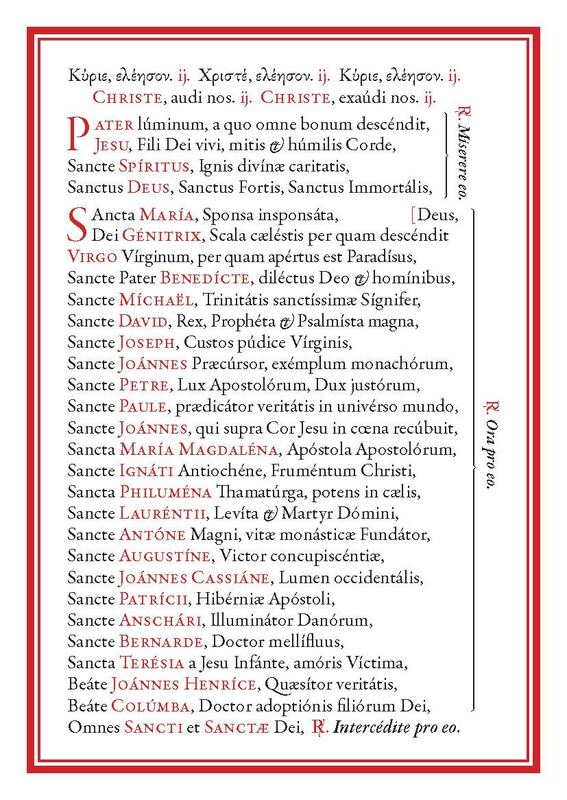 Those who attended Sacra Liturgia in 2013 in Rome would have seen the remarkable black hardcover that contained the texts for all the liturgies (solemn Masses and Vespers) of the conference -- in parallel Latin, Italian, French, Spanish, German, and English translations! (A couple of pages from this book are below.) Dom Benedict's work is characterized by elegant lines, balanced elements, a judicious use of typographical variations, and, most of all, an eye for tiny details of punctuation and spacing. He truly offers us a model that can inspire our own efforts in this area. 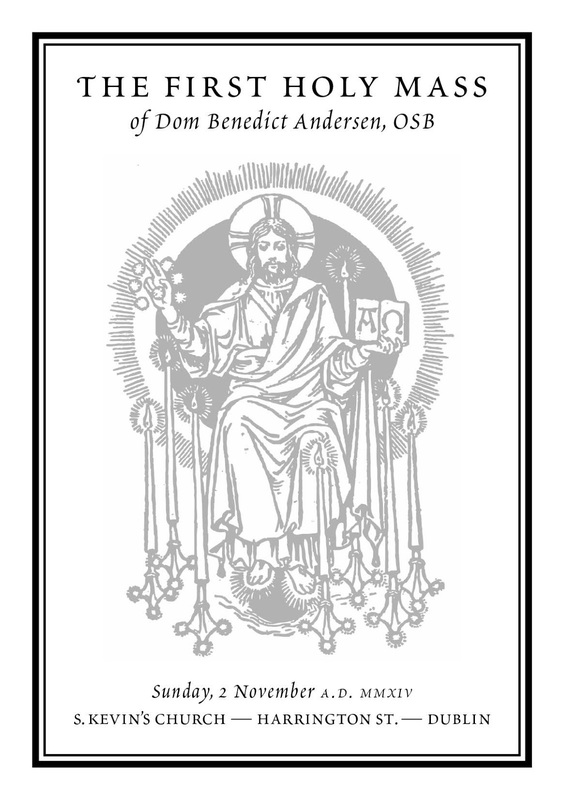 When Dom Benedict and I were corresponding about the art of printing, he did specifically ask me to say that he is not available for commissions, as the routine work of producing materials for the monastery and for special occasions as requested by prelates is already keeping his hands quite full, and maybe overfull. This coming Saturday, September 26th, Mgr Keith Newton will celebrate a High Mass in the Ordinariate Rite for the feast of Our Lady of Walsingham. The Mass will be held at the Church of St Agatha on Market Way in Portsmouth, beginning at at 11 a.m. (Click here for information about how to find the church.) As I am sure many of our readers know, Mgr Newton is the prelate of the Personal Ordinariate of Our Lady of Walsingham, the Anglican Use Ordinariate in the United Kingdom. An address will be given by Bishop Michael Nazir-Ali, former Bishop of Rochester and before that Bishop of Raiwind, Pakistan, on the subject of persecuted Christians. The Newman Consort will sing Haydn’s Missa in tempore belli (Paukenmesse), accompanied by an orchestra. Refreshments will follow, and all are very welcome. 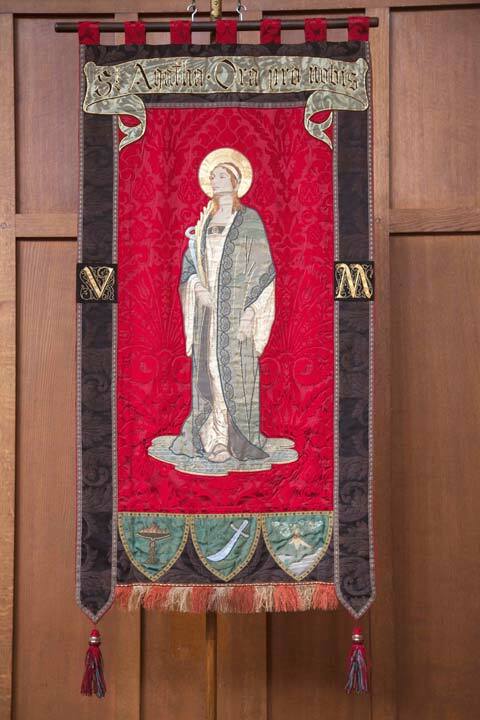 Below are some images from the parish website; a Low Mass, the Lady Chapel, and a banner of the church’s patron. St Agatha. Click here to browse their image gallery. 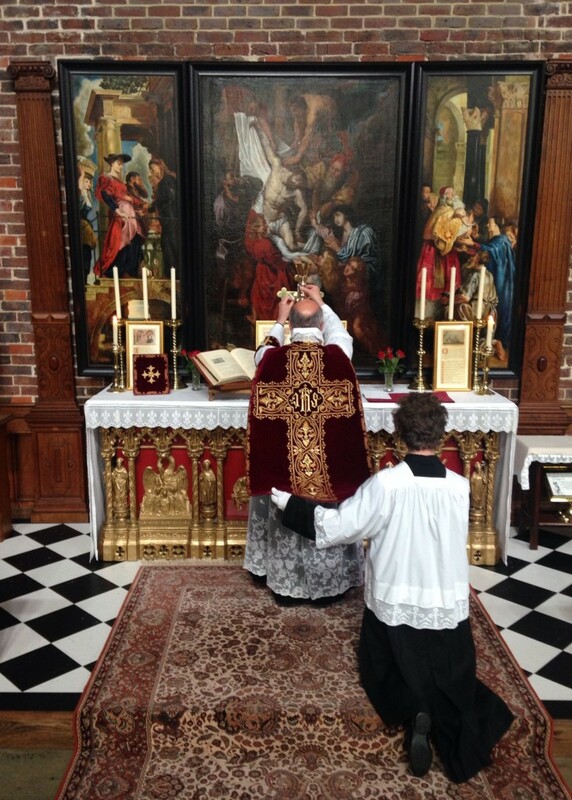 As always, with many thanks to the readers who have sent in pictures of these liturgies.